With warm weather here it is time to be outside. All day. Just outside, no matter what we are doing, just being outside makes it a good day. We go barefoot outside. Together! And we make discoveries outside. Can you see the little beetles? No matter what we are doing we just stay outside! Until it is nap time or bed time we stay outside. And this outdoor play party is giving me lots of new ideas to fill our outdoor time! Thanks for all the great ideas. Keep them coming!!! I would love for my girls to play at the place in these photos! You have to read this post and see the amazing playspaces that are captured here. 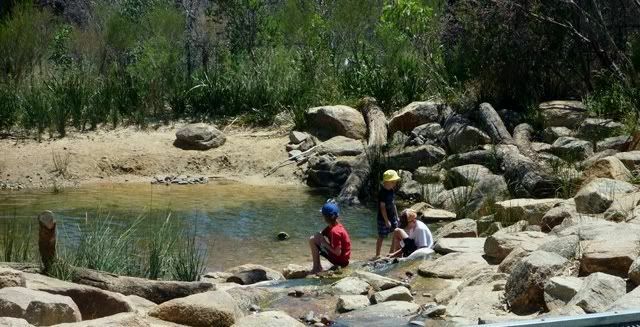 The Best Playground in Perth by Child's Play Music. This is a new blog for me and I am so glad they linked up. Whenever we come to St. Louis my girls love to go to the "big" zoo! So even though St.Louis was surrounded on all sides by severe storms we headed out with cousins and friends today under clearish skys. With rainjackets and boots in tow just in case! Avery just loved the river otters. And we saw babies!! We loved how the baby elephant walked right underneath the big mama! And look at that cute little trunk! Then we saw a little baby monkey. And here are two new things that I learned today at the zoo. 1. Let my kids go at their own pace. At one point Avery was lagging behind the bigger kids because she just wanted to stay and watch the otters. My instinct was to pull her away and tell her to join the rest of the group. But then I stopped myself and just let her stay there as long as she wanted. It occurred to me that if the outing is truly for them, then I should let them dictate how long we stay at each exhibit. What does it matter if we run out of time and don't see the whole zoo? I am often pulling the girls away from something to get them to move on to something else and I realized today that I should slow down more often and do things at their pace! 2. Use the signs. My niece is a beginning reader. She really enjoyed trying to read the signs and share the facts with us. And then my sister starting reading them first and asking Bailey if she could find on the sign where it said something, like where the animal is from or what it eats. Then Bailey would have to read the sign and tell us that specific fact. It was a great activity! A great day was had by all. And only a few raindrops landed on us. I have to tell you about a couple of great posts before I share my favorite. Did you see the post from Sun Hats and Wellie Boots? We found the book she suggested, The Gruffalo, and my girls LOVE IT! I missed entering this giveaway but the handbooks look amazing! Great review and post over at Mommy Labs. But my feature for this week comes from Rainy Day Mum (someone that I have featured before! Her posts are just so darn good!). The reason I am featuring this one is because she is writing about what is absolutely my most favorite activity to do in all the world; hunting for spring! I am anxiously awaiting the day when I walk outside and see all kinds of green things poking out of the ground. We have so far been burying the few things that we have found because it is just too early but when spring really comes I will be hunting for those green leaves like crazy! And I can't wait to check out the book that she recommends. So I have noticed recently that a lot of folks that are linking up are not posting the button or letting their readers know that they have linked up. I would LOVE to share so many of these great ideas on Twitter, Pinterest and Facebook but the rules state that you have to share the link up if you want us to share your post! So please be sure to go back and add the party link up!! Thanks everybody. We took Sam downhill skiing! At first she was very unsure and Chris almost had to carry her down the bunny hills. But eventually she figured out how to lean forward, bend her knees and stay up! By the end of the night she was so tired she couldn't stand up anymore! We had a great time and are hoping to get her on the slopes again very soon. The one big tip that I have to share from our experience is that giving them an example to watch is a HUGE help. At first on the little hills we were just having one parent take her up and ski down the hill. But when we got her on a longer hill and I was able to ski alongside her she did much better. I was able to show her what to do by example. I said things like "watch me", "see how I have my knees bent", "lean forward like me" and "keep up with me!" She loved being able to "race" me down the hill. And it really helped to keep her focused and paying attention to what she was doing with her body. I found a post linked up this week that gave some great ideas and I thought it needed to be highlighted one more time! I love finding new ways to take what would normally be indoor learning outside and this post offers some great suggestions. Check out Outdoor Literacy from Growing Book by Book. And if you haven't read her book suggestion you absoltely MUST pick it up! Now on to the link up! We are welcoming a new cohost this week. So be sure to check out The Golden Gleam and the great outdoor play they are up to over there. How are you enjoying the outdoors this week? Backyard outside time can be a challenge when your yard looks like this. Which is why we have been going for hikes and to the park this week. But backyard time is convenient and necessary for little ones. So, we got the sand toys back out. The left behind clumps of hardened snow/ice were a great challenge to try and break apart. And the larger piles made for great packing snow. We also added a new element to their backyard play. Chris used a log we found by a neighbor's curb this past Fall. He cut the log into slices. They have been done for a while but I have been saving them for when the girls's needed a little extra inspiration in the backyard. The tree "cookies" are great for stacking, adding to snow castles, plates for pretend food, etc. The options are endless! I picked the feature this week because it really spoke to me about the power of outdoor play. Trails, Tents and Tireless Kids used some simple activities to change the mood of their afternoon. Not only can the outdoors work wonders on your children's mood but it can also do a lot to help calm the nerves of stressed and over tired mommas! Head over and see the great outdoor play that this momma used to turn a challenging afternoon into a great end to their day! The day before the snow came the girls and I had a great time with the sidewalk chalk. They drew rainbows, suns and shapes while I wrote out the whole alphabet. Once the alphabet was written I showed the girls how we could sing or say the song while we hopped along on the letters! They were both eager to try it out. It was a blast and we went both forward and backward on the alphabet. Then, we (mostly the girls!) were so excited the to see that the alphabet was still there when we shoveled the snow away! Since I was the one doing the shoveling and all bundled up I didn't get the camera to take pictures of them in their snow suits jumping on the letters. But I came out later to at least capture the letters partially covered with the snow. They had a blast once again jumping along the letters and it was great to see them saying the letters together as they jumped. This was a tough one. There were 36 entries that were all great and so many wonderful new ideas. But one mom takes the prize for being my hero of creativity! I can just hear her voice, I can feel her eagerness to give her child what she wants and the whole thing is just hilarious! But in the end it is an AWESOME idea and an amazing job of one mom to get creative with her kids outdoors. So head over to Sense of Wonder to see how you can make a snowman in Texas! When you have weather like this in January it is not a choir to get outside! Mid-40s and sunny is crazy weather for Wisconsin and I have to say that I am really starting to get mad that we don't have cold temps and tons of snow!! Where is winter? But since it is warm we are getting lots of outdoor play time. Today we explored around our own backyard to see what our local wildlife has been up to. Lots of fun holes to find and explore. Our compost heap makes a great place for wildlife to hide out, find food and an even better place for us to explore! And then there was some tree climbing! I mean how else can you see if the birds are at home? A great outdoor play morning! Even with sick kids!! 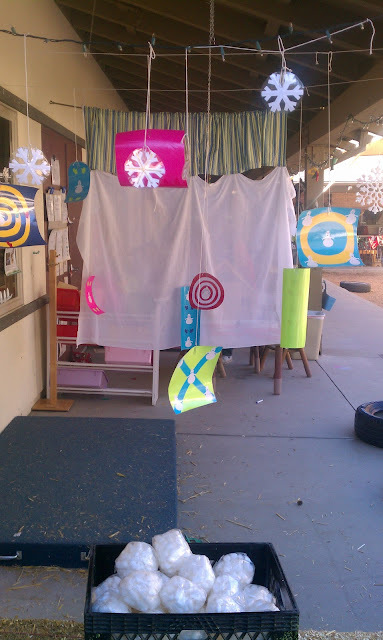 I was super excited when I saw this post on Exploring the Outdoor Classroom because I have been wanting to collect some snow play ideas, just in case winter ever actually arrives! And then I was so amused to see that her snow play idea didn't involve snow at all!! So very clever! Check out snowball target practice. Super simple idea but what a fun game to have up in the preschool outdoor play area. Thanks so much for linking this up and sharing! Cold and no snow is not great weather for outdoor play. The kids get cold quickly, bored more easily and have more limited things to do. BUT with cold, comes ice and the fun of watching our stream start to freeze over. Our weather has been on and off cold; 40 degrees one day and 20 something the next. This isn't great conditions for ice to form. But we decided to do some ice hunting this week just to see what we could find. We didn't find much, but a few small patches were enough to require giant sticks to make sure that every last little bit got broken up! We have been making frequent trips to the stream this week to find these tiny little spots of ice. These trips don't last hours, usually only about 45 minutes, but it is enough time for the girls to get some energy out, use their little muscles to wield a big stick and some great fresh air for all of us. If you have similar weather but with more rain/freezing and there are icicles forming you could also do an icicle hunt! Now on to the LINK UP! Ever gone on a sound hunt? I had never thought of this one and it is so simple but genius! Sun Hats and Wellie Boots linked up this week with their sound hunt and I am in love with this idea! For some reason I can't link up an image but follow the link to see how a walk with some simple drum sticks turns into a real learning and play adventure! We are filled with the Holiday spirit at this house and decided we needed to do something nice. I am trying to teach my girls that there is more to the season than giving presents and lots of beautiful decorations. So, I told the girls that we were going to play Santa for the day. Since he does something nice for us we should "be like Santa" and do something nice for other people. Sam responded by saying "Then Santa will see me being nice and put me on the nice list!". Not exactly the lesson I was going for but I guess it is a start! 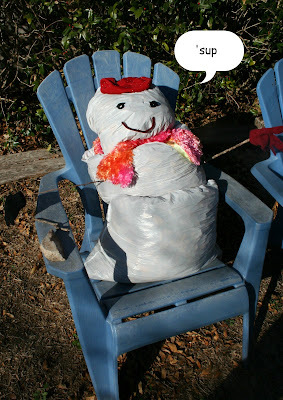 Anyway, we got our Santa hats on, grabbed some trash bags and headed to one of our favorite parks. The girls (and our friends Petyon and Taylor) got very into finding trash! I loved seeing them so committed to getting every piece of trash. It was a pretty good clean up for only being about 30 degrees! And everybody had a good time. Great way to combine outdoor play, exploring and a helpful clean up project for our community. Now on to the feature of the week! Happy Little Messes had a great idea this week to save some big seeds and let her kids "plant" a autumn garden. I love the idea of kids getting seed planting practice, digging in the dirt and using gardening tools just like they see their parent's using. Great outdoor play Happy Little Messes! Thanks so much for sharing. Okay, so I have been trying all morning to load pictures of the house and setting that we are in but either my pictures are just too big or the internet here is just not strong enough, I don't know. But the pictures just won't load. I will be working on figuring this out! Anyway, we are in a beautiful place with a pool, golf course that we can run and play on when golfers aren't there, a beach within walking distance, lots of green space and much more! Can't wait for all the outdoor play we have ahead of us. Hear more about how to create an awesome outdoor play space in a few days (Nov. 30th) when Kristin from Exploring the Outdoor Classroom stops by to guest post! Now, on to the feature for this week! In think Jada Roo Can Do rocked the outdoor play this week by setting up a whole shoe shop for her kiddos outdoors. How cool is that? Sure it probably took some time to get it all out there and set up but I bet the kids had a blast! Love how this mom took the initiative to bring toys into a whole area for her kids and turn what is typically indoor play into some very creative outdoor play!